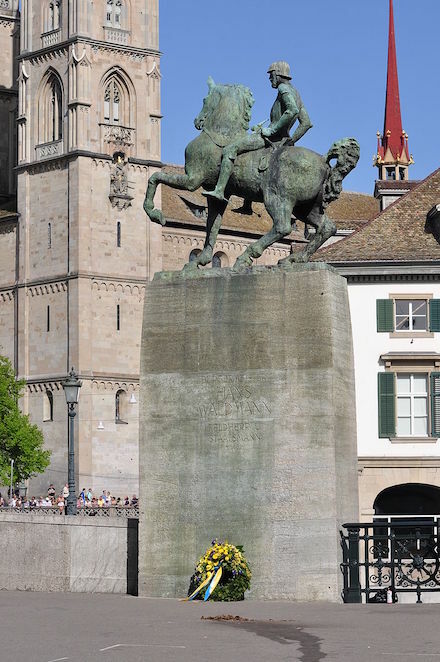 On this date in 1527, Anabaptist Felix Manz was trussed hand and foot and shoved into the Limmat in Zurich — the first martyr of the Radical Reformation. 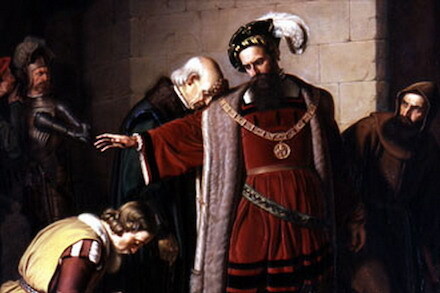 As the Protestant Reformation made theologians of everyone without a concomitant social embrace of religious pluralism, it wasn’t long before men who would have been fire-eating heretics in Catholic eyes a decade before were turning their swords on one another for deviation from their own new orthodoxies. They also have retained with the papists, the swearing of oaths, the office of secular authority, war against enemies, and sometimes also against each other, etc. 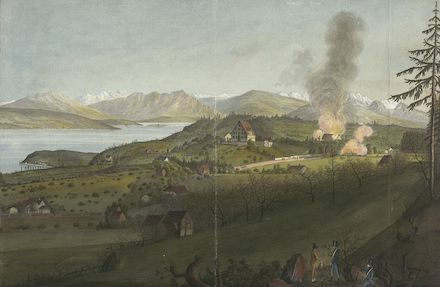 In Zurich, former Zwingli follower Felix Manz (sometimes spelled Felix Mantz) co-founded a splinter group of Anabaptists and picked a fight with city hall over adult vs. infant baptism. 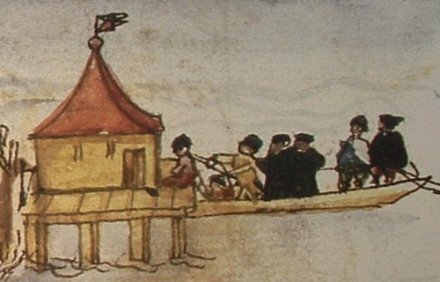 Zwingli has been dinged by many a true believer then and now for his compromises, but the man had a city to run and better reason to worry about the movements of nearby Catholic armies than an endless disputation over baptism. 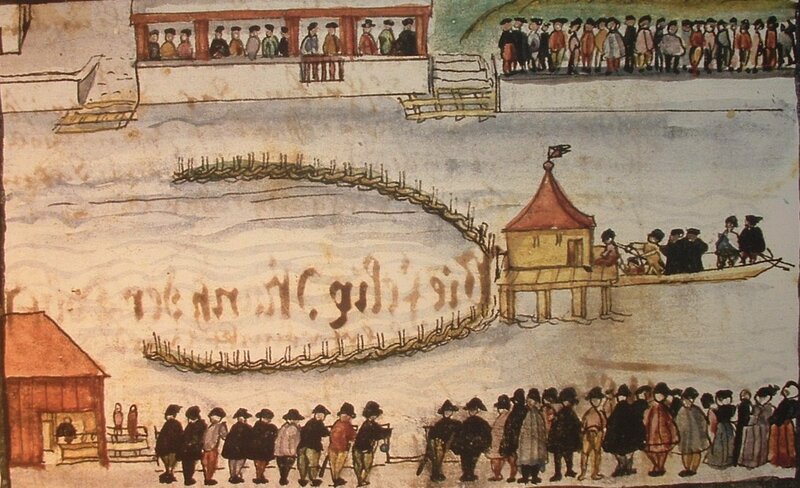 When the city had had enough, it declared drowning for adult baptism (“rebaptism,” to its opponents). Water for water, see? Zwingli’s eventual successor recorded the scene. 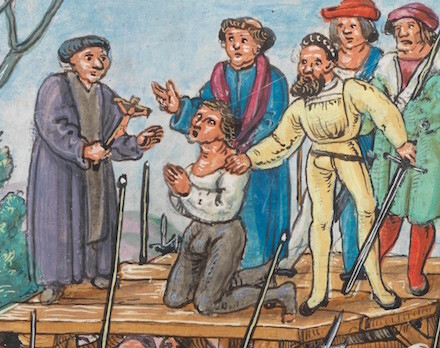 As he came down from the Wellenberg to the fish market and was led through the shambles to the boat, he praised God that he was about to die for His truth. 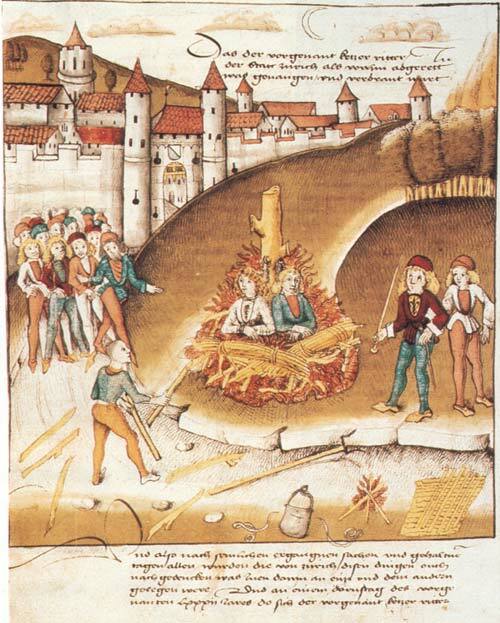 For Anabaptism was right, and founded on the Word of God, and Christ had foretold that His followers would suffer for the truth’s sake. And the like discourse he urged much, contradicting the preacher who attended him. On the way his mother and brother came to him, and exhorted him to be stedfast; and he persevered in his folly, even to the end. 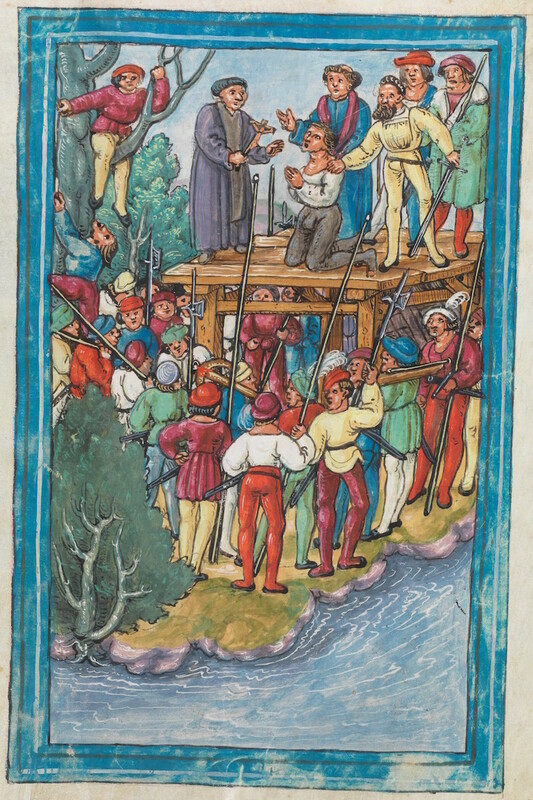 When he was bound upon the hurdle, and was about to be thrown into the stream by the executioner, he sang with a loud voice: “In manus Tuas, Domine, commendo spiritum meum.” (“Into Thy hands, O Lord, I commend my spirit.”) And herewith was he drawn into the water by the executioner, and drowned. 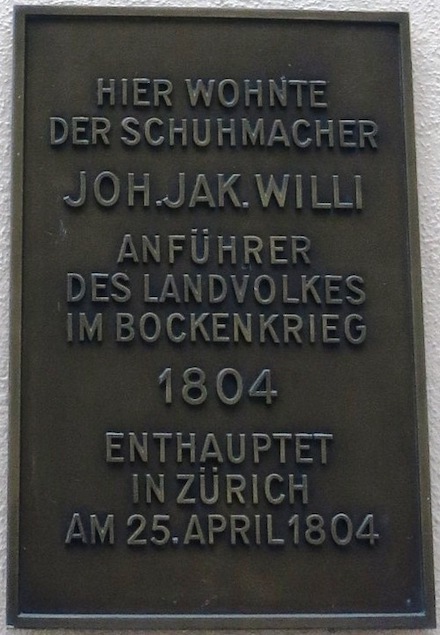 Felix Manz drowned in the Limmat. If this dispute seems rather shallow cause for spilling human blood, it’s part of a fathomless theological debate only now becoming water — ahem — under the bridge.